Having a mobile specific layout allows on-the-go visitors to quickly access to telephone numbers, email addresses, and directions – exactly the sort of thing a visitor from a mobile device might be there for. This tutorial isn’t about creating an entire mobile version of your site, although some of the stuff you’ll see here today can be used for exactly that. Instead, this is a means of offering a quick introduction to visitors from the mobile world before passing them through through to your main site. To make this easy, I have provided a mobile template for you to download, which means that all we will have to do is set up redirects for mobile browsers. You can customize the template landing page however you see fit – it’s just standard HTML/CSS. Create a directory (or page) to send mobile users to – some common subdomains are “m” or “mobile” (eg. m.digg.com and m.facebook.com). We will be using JS Mobile Redirection to redirect mobile browsers, the script can be downloaded on GitHub. Place the .js file wherever you choose, I have placed mine in a folder called “js”. This will send any visitor that arrives on the index page to the subdomain “m.website.com”, but only once every hour. If they press the link on the template page that says “continue to full site”, they will not be redirected within the defined timeframe. That’s pretty much it. Congratulations, you have a mobile landing page – now go forth and customize. Note: If you are redirecting to a specific page rather than a subdomain you can do this by including mobile_url : “website.com/mobile” and mobile_prefix : “http”. Refer to the documentation for further explanation. This is the tag that determines how the page fits to the screen and if a visitor can zoom in and out. Mozilla does a fine job of explaining this in great detail, check out their page on the viewport meta tag for a more rigorous exploration. For more information regarding possibilities on iOS, check out the Safari Web Content Guide. Some nice ones to start with include their viewport and text size adjustment pages. @Tom that was my first thought but it’s a bit more than that. This one is actually useful rather than a self indulgent “skip intro” style splash screen of old. Only issue I would have is with the js detection, looks like it needs jquery (and the rest of the page/assets. Would be better to do it server side (if possible) or have a small script up the top of the page to redirect asap. If you’re traveling and want to quickly check the phone number of a restaurant, you don’t need to be greeted with the full site. The concept behind this is more contact info driven than glorified splash page. Nice thought Sam Dunn, appreciate such techies like you. This is a really neat idea. It kind of goes along with the notion that using “responsive” designs isn’t always best for mobile, because you still have to load all the content, then hide it. If you give mobile users super quick access to the info they are probably looking for, that would be a huge help. Faster loading, less searching for info, in and out! What happens if the mobile browser has cookies disabled? Do the visitors get sent in a never-ending loop and never get to actually view the full version? 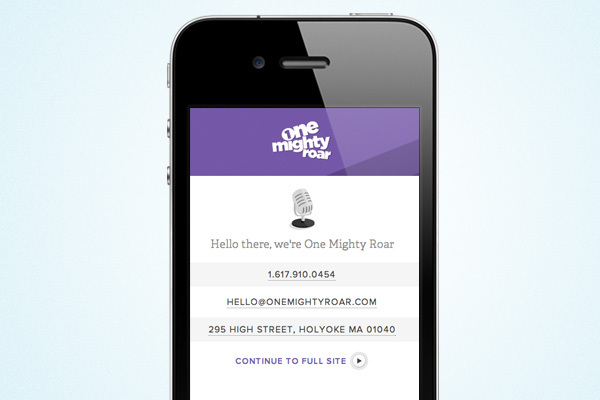 Just went to One Mighty Roar on my iPhone, looks awesome. This is great. Looks great! Thanks for the idea, I might try it out :) But, like @Jordan said, what if cookies are disabled? Is there a way to make it so it doesn’t redirect if that’s the case? Thanks for the great article. I have a question though: I’ve tested it on an iPhone 4 and it works great but I tested it on a HTC Desire HD and it doesn’t display the mobile site – I just see the full site straight away. How do I get it to display the m. version when the user first hits the site? (as it does with the iPhone). Thanks in advance. What do we have to edit to achieve a redirect from any page? With the current setup you would need to also have the JS redirect on that page, pointing to the page you wanted. Before reading this post i was thinking that the only designers can make mobile compatible site but now i can do this task also. Thanks for sharing. Looks nice, but you should make the browser bar move out of view on load. Pretty interesting and easy to use. I just used it on alenelias.com and my own site e11world.com and tested on my X10a (android 2.1) and it worked aside from the Continue to full version part. Not sure how I would direct the user to a full version of a full flash site? Great Post and I’m going to try this out. I have a question. Suppose you were running an adwords campaign and your landing page was http://www.somesite.com/landingpage……and suppose you set up the standard site landing page and a mobile version landing page….and a mobile user clicks on your ad goes to the http://www.somesite.com/landingpage and then is redirected to the http://www.m.somesite.com/landingpage……. Wouldn’t this violate Google Adwords redirect policy? I’m not sure so I posing this question to see if anyone is a subject matter expert because I could really see a huge benefit to running the mobile version in an online campaign. I’m kind of unsure about this. I’ve noticed that many of my friends get upset when mobile sites display content differently than the regular sites; They have all learned how to navigate on pages that weren’t designed for their phones and don’t mind it so much now. I think it’s good in theory, but in practice I can already imagine that it would give off the impression of a splash screen as the first commenter said. I would be VERY interested in seeing some usability testing on this concept. Has the impact on organic search results on mobile been considered? This really doesn’t have an impact on that – when you Google “Facebook” from a mobile phone you aren’t getting different results than if you were on a desktop. What if I go to the specific website after a google search and I should be taken to an inline page? After getting the awful landing page I am taken to the homepage if I choose so not the actual page I was looking for. It looks as something rather handy, but it depends on what website you make this for. If the website is like an interactive folder, this will be really useful, but if you really need to acces information on products or services, contact-information is useless. Then you would have to reconsider what to make of this landing page. But, as Luke Wroblewski has already stated, designing websites nowadays should start by designing for mobile devices and then eleborate it for use on a bigger screens like pc’s/laptops. This way usability is narrowed down to the most elementary form and forces you to focus on the navigation structure/information architecture. Well with a WordPress installation it is so much easier. A simple plugin detects all mobile phones, including iPhone and Android and redirects the css. Its fast and easy. Is there any other steps I need to take to create a mobile directory on my server? Brilliant, will come in handy when I start development on a mobile version..
Great tidbit of info! Just one little noob question, how do I create the m. prefix? I have a question, is their code to hide certain sections or things when viewed on a smartphone? Example: we have a wordpress toolbar plugin we created and we want to hide / disable it when viewed on a smart phone. Just wanted to say thanks for sharing this. Got a few clients looking for this feature, it’s going to get more and more popular! Thanks for the great article. I like your idea about only presenting the important contact information on the mobile site. I can see real benefits to the way you have this setup. Thanks for sharing the idea! Thank you. A modified landing page for mobiles with contact info as mentioned is a great idea. Lets see how it goes, if it works as good as it sounds then it’s going to come in very handy! Most of the trouble in the world is caused by people wanting to be im-portant. Great article, I think the reasons behind going mobile are well-put. We just launched a mobile landing page builder (http://landr.co) to solve many of the problems you bring up, but for the person without coding experience (small business, event peeps, campaigns, etc). I think “simple” is always appreciated! Great article! Just one little question, how do I create the m. prefix? While a mobile landing page is a good path to take, I would not recommend this approach at all- you should really be handling this server side, it’s simply too much overhead to handle client side (especially for cellular network traffic). The whole “fit to screen”-thingy didn’t work for me on Android. I replaced the meta viewport tag with … By the way: thanks for this great post! Great work, thanks for that! This works perfect. You saved me. Thanks. Great tutorial, although server side is better with user agent with the guys from handsetdetection.com. Although this is a great quick fix ! I have an iPhone and I HATE mobile websites, but this is very acceptable. I’ve been searching for a good solution and this is perfect thanks! I’m going to use it for my clients too. with “mobile” being the name of the folder/directory? Also…would I leave the name of the Mobile Landing Page as index.htm? I hate mobile websites too, they’re such a pain. But this works really well to give visitors the information they need right away with speed. The trouble with smart phones is that inevitably the users have a poor attention span and unless they find what you want quickly they are likely to go somewhere else. I guess that’s the classic design conundrum, how to create the ballence of functionality, attractive design and loading speed. Thanks for the tutorial. Thank you so much!!! This is so awesome. Just did it. Can’t believe it was that easy and I’ve been racking my brain for the last two days trying to figure out what the heck I was doing wrong. So awesome!! Once it gets as technical as server side scripting, I do get a bit of a panic on! The ingredient that seems to be missing in this discussion is any thought about what the happy little mobile toting customer wants. Some have been dismissive of just presenting the basic contact info on the mobile screen, but surely that is most likely what this type of customer wants, particularly when they are looking for a local solution to their current need or problem. The notion that people would choose to navigate round the full size page on their mobile device doesn’t really hold water I feel. It just presents so many obstacles to comprehension and access to info. Mobile sites are a necessity; love them or loathe them and the sooner we get our heads round them, the sooner we start accessing those affluent customers that we would all like to have on board. Thanks for the article even though I’ve now got a headache trying to understand it. Great idea. Super minimal and nice looking, yet delivers what’s most important effectively. If contact information isn’t what I wan’t, boom, “continue to full site” is ready for me to click. Since many visits to my website are now from people using a mobile, and i think visitors using mobiles to access the web is only going to increase. i will have to create a mobile version of my site or at least an entry page as suggested. I think the splash page style is a great idea and has got me thinking that it could include links to the more important parts of my site. As for redirection i was curious if search engines would identify a mobile user and give them mobile biased results > sending them automatically to mobile page ? I will soon experiment and create an m/subdomain ! Like the idea its got me thinking. Furnishing concepts for making your home interior. News and fashion trends from the world latest shows. Keep up the superb work , I read few content on this website and I conceive that your website is very interesting and holds sets of fantastic information. Maclynne is the No.1 Corporate Training Institutes provides best Training for Java Training, J2ee Training, J2ee Certification, J2ee Projects, java j2ee training in marathahalli, Bangalore. Thanks sam, Great stuff again ! Hi Sam, This is great, but “Continue to full site” redirects me again to the mobile version. Any idea what I am doing wrong? Everything else works as expected. Thanks! Will it work for RIM Blackberry? I heard that BB dont allow JS to load in them. This template file is relay great and relay quickly access to telephone numbers… Nice information… Keep it up…. thanks buddy i was searching for this good work !! i m creatin a mobilestore project,in home page of that pro. showing many pic of mobile and i wanna show description of mobile when i click any mobile but i dont know how so plz tell me?…. i m creatin a mobilestore project,in home page of that pro. showing many pic of mobile and i wanna show description of mobile when i click any mobile but i dont know how so plz tell me its code? Do I need to make any changes to the script inside the redirection_mobile.min.js file I downloaded? I’ve uploaded the template folder provided, along with the .js file to my server and pasted the code provided within the on the index page of my main site and it does nothing different when pulling the site up on my iPhone. The only change I’ve made thus far is editing the script pasted into the main site index page to point to the folder I made for the .js file on my server. I instead called the folder ‘Script’. Magnificent site. Plenty of helpful info here. I am sending it to a few buddies ans additionally sharing in delicious. And of course, thanks to your effort! Does this override your website’s current mobile setttings? For instance, if your site is viewed a certain way on mobile devices and you have a QR code scanner set up to send them to a specific landing page, would it allow the user to view the landing page without automatically jumping to the mobile version of the site? Simple but effective. Looking forward to read the rest of your tuts. Thanks, it’s worth a try and will let you know if I succeed.. I am searching for info to provide free subdomains to my users like bravehost. How it is possible? Thank you for making the only actual tutorial that I’ve been able to find. Other ‘tutorials’ haven’a actually explained how to do things, but you did so, very clearly. I keep getting a “pageok” text when i access the mobile site. What does this mean? Does the landing page allow for click to call functionality? I am really impressed with your writing talents as smartly as with the format in your weblog. Is that this a paid subject or did you modify it yourself? Anyway stay up the nice high quality writing, it is rare to look a nice blog like this one nowadays. What is the purpose of the one hour delay? Also, what’s the purpose of disabling the “full site” feature? … assuming some mobile users will want that. Thanks! Good site you’ve got here. It’s difficult to find excellent writing like yours these days. I seriously appreciate individuals like you. hope you will update site with new excellent. Take care. Can someone post the file for the code ? js/redirection_mobile.min.js. Mobile Website is so important for business now. 20% of all google searches are done via mobile. Mobile Website: Mobile Website is so important for business now. People are using their mobile and smart phones for browsing for the information. Heh I have been looking for you or something like this …but what you call a template is not the same definition for me..it does not seem like i would know how to follow your instructions. Is there another way or some real template where you just fill in data perhaps? or who can do this for me? because i would have to decode your instructions..but i am closer I feel to my initial dreams of a simple actionable mobile site. Excellent goods from you, man. I’ve bear in mind your stuff prior to and you’re just extremely wonderful. I really like what you’ve got here, certainly like what you are saying and the best way by which you are saying it. You make it entertaining and you still take care of to keep it wise. I can’t wait to read much more from you. This is actually a great web site. A question, how can I add a Paypal button with couple of payment options to a mobile landing page like this? everyday smartphone internet users are increasing so we should always make sure that our sites are mobile friendly. Great idea and tutorial, thaanks for the template! Not a bad idea, If you cant close them on a responsive design or a full mobile design.